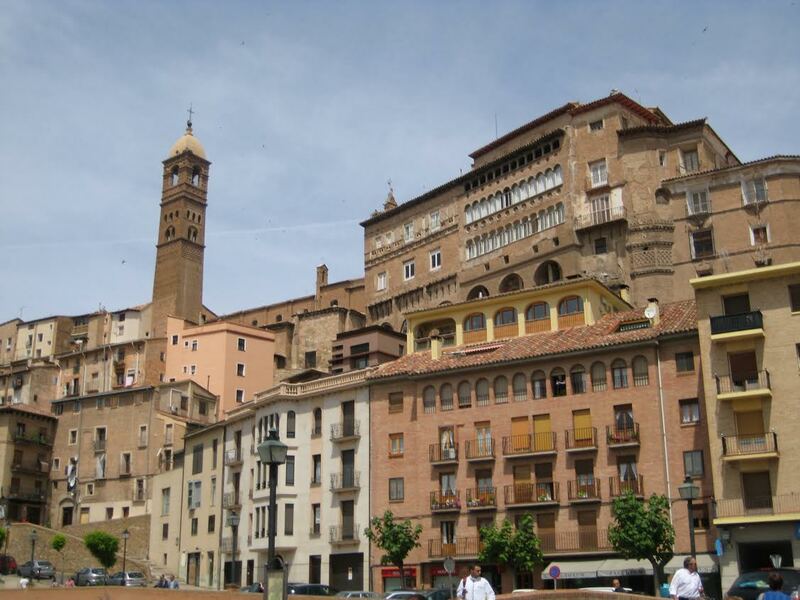 Tourists visiting Aragón region should not miss the chance to visit Tarazona whose magnificent cathedral, also known as” La Seo” is considered to be one of the jewel of the Spanish architecture. 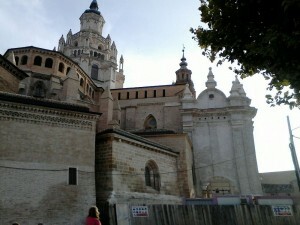 In fact, the town really has an impressive ensemble of Mudéjar buildings, as well as an interesting old quarter (casco antiguo) with an exceptional historic and artistic heritage where Jews, Muslims and Christians coexisted for a long time in the medieval times leaving an unmistakable cultural imprint on Tarazona. Tarazona is situated in the Queiles valley at the foot of the majestic Moncayo massif (its highest summit is San Miguel mountain that rises 2,314 m), in an outstanding natural landscape of exceptional beauty in the western Aragón. 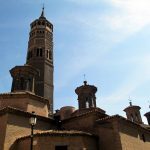 Although Tarazona only has a population of about 11,000, the lively town certainly has a lot of to offer in the way of architecture, culture, nature, gastronomy, sport, festivals among other things, without forgetting its rich cultural heritage. Taking an enjoyable stroll along its steep and narrow cobbled streets is the ideal way to visit this historic town, because the most important buildings and places are within walking distance including the cathedral and the old bullring which lie on the other side of the Queiles River that flows through the town. Cathedral of Nuestra Señora de la Huerta, which has three naves and Latin cross plan, was begun its construction in the 13th century in French Gothic style although it was not finished until the 16th century in Mudéjar style. Therefore, the outer face of the Gothic Cathedral was covered by Mudéjar construction, as well as other Mudéjar elements were added inside the cathedral between 15th and 16th centuries, such as the absolutely amazing dome (cimborrio) a masterpiece of Mudéjar art that was built in the mid 16th century by the prestigious maestro Juan Lucas ”Botero”. The beautiful cloister was rebuilt between 1495 and 1525 in Mudéjar style too. 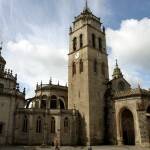 As for the spectacular square bell tower, it was constructed in three different styles: Gothic, Mudéjar and classical. 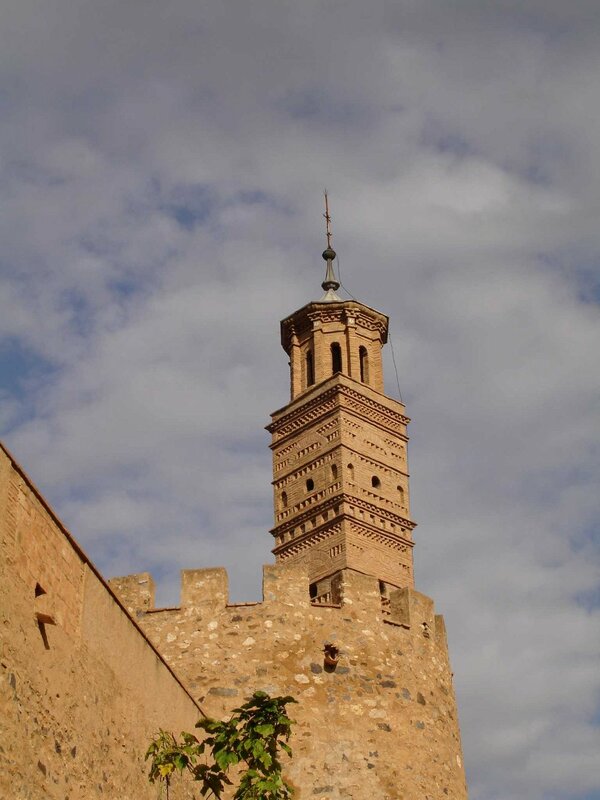 The Gothic base of the tower was built in the13th century; the second stage of the tower was built in the late 15th century in Mudéjar style; finally, the tower was completed in the late 16th century in classical style. If visitors go into the cathedral, they will be able to see the Gothic mural paintings on the dome which were discovered by chance when the cathedral was restored in the year 2000, the valuable painting is considered to be unique to Spain and it is known as the Sistine Chapel of the Spanish Renaissance. Besides, the beautiful choir stalls dating from 15th century; the choir’s domes that were decorated by Vicente Berdusán in the 17th century; the beautiful main altarpiece and the organ are also worth a visit. Obviously, the cathedral is a must see place. The old bullring was built in 1792 to celebrate bullfights, however, in the mid 19th century another new bullring was built, and the old one has been used for street market, festivals and other events since 1870. 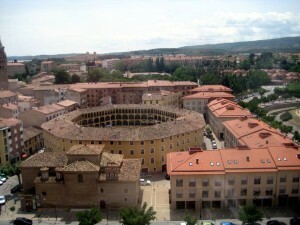 The bullring, which is surrounded by houses, gives the town a picturesque character. The cathedral and the bullring are near the Santuario de la Virgen del Río where visitors can enjoy a Baroque altarpiece dating from 17th century with the patron saint of Tarazona, as well as the Convent of Santa Ana built in the early 17th century in Mudéjar style. Santa María Magdalena’s church is situated in the popular Barrio del Cinto (Cinto neighborhood) with its attractive bell tower above the river. The church was the first cathedral built in Tarazona and its construction was begun in the 12th century in Romanesque style, although it was restored and finished in the early 15th century with Mudéjar elements, such as the wooden ceiling (techumbre) in Mudéjar style. Inside the church visitors can enjoy the main altarpiece. The bell tower was built between 12th and 16th centuries in Romanesque and Mudéjar styles. 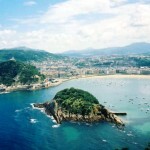 In this area visitors can also see remains of the the medieval wall. Concepción’s Convent was built in the mid 16th century in Mudéjar style, its bell tower was built over the medieval wall in Mudéjar style too. 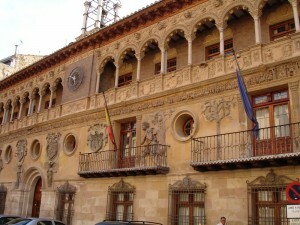 The Renaissance Town Hall building lies in the Plaza Mayor in the heart of Tarazona. This emblematic palace was built in the mid 16th century. Anyway, the building has been restored several times since its construction. Moreover, Tarazona has other interesting buildings and places worth a visit, such as San Francisco’s church; the Archbishop’s Palace from 16th century in Renaissance style; the Jewish neighborhood which is remarkably well preserved; the hanged houses; without forgetting the famous Cipotegato, the most popular fiesta of the town where visitors and local people can enjoy the traditional Festival of San Atilano on 27th August every year.. In addition, Tarazona was founded by the Celts in the 2nd century BC, after that, the Romans, the Visigoths and the Muslims dominated the town until Alfonso el Batallador, king of Aragón (1073-1134) reconquered Tarazona in 1119. 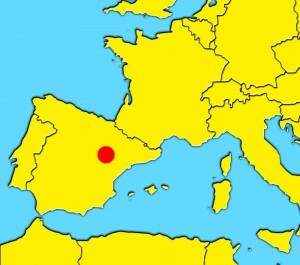 Tarazona is 85 km away from Zaragoza, 12 km away from the Monastery of Veruela and 25 km away from Borja. 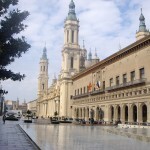 – Zaragoza: With almost 700,000 inhabitants, Saragossa is one of the biggest cities of Spain. 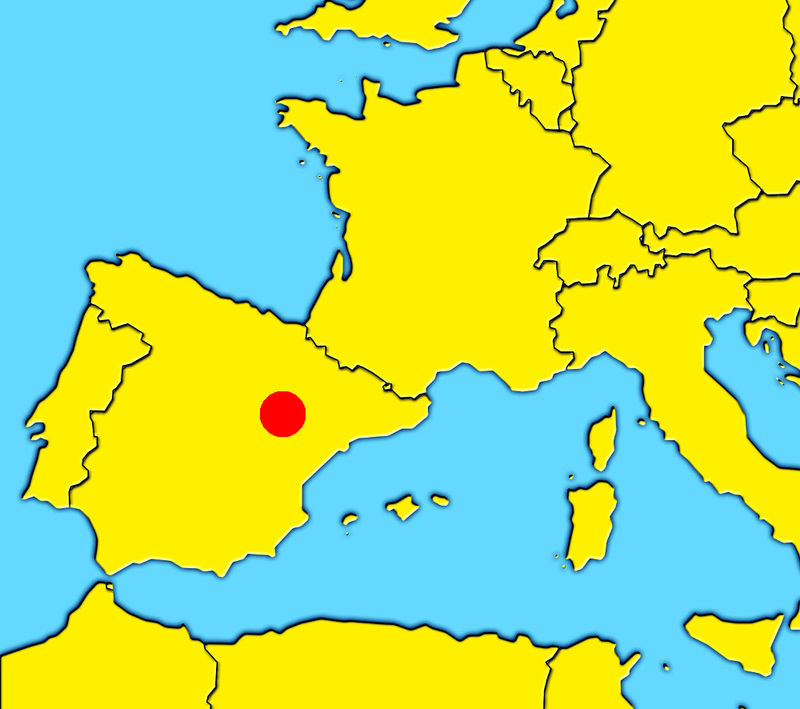 – Huesca and The Pyrenees. 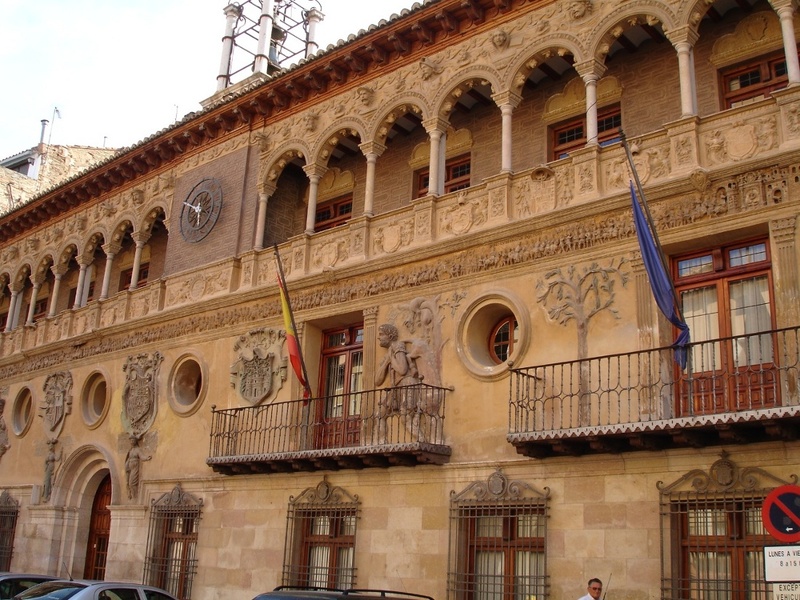 – Teruel: Located in the south of Aragón, Teruel city is an ideal city to live and enjoy its interesting museums, unique architecture, traditional festivals, delicious gastronomy, among other things.